I really wanted something quick and easy that I could make as a last-minute Christmas gift for my sister. So I designed this for her on the fly and liked it so much that I decided to share the design in my collection. Knit in the traditional top-down raglan way, with bulky-weight yarn, this cardigan definitely lives up to its name. 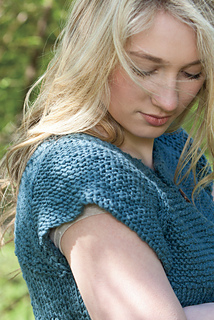 The garter and stockinette stitch sections offset one another and create a nice contrast of knitted textures. The cap sleeves are simple, and the button holes can be placed wherever you want them. A garter hem finishes the look. All of it makes for a quick knit. It isn’t exact because of the thick and thin yarn I used, but it’s close.